Life is filled with tangles, but with our true wireless earphones, you can ease up and have Peace of mind. 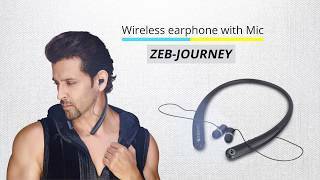 Presenting Zeb-Peace, your wireless entertainment companion, the true wireless earphones that will get you through a grueling workout, arduous hours of travel or a really long day. Get more answers with double tap shortcut for voice assistance like Google assistant and Siri. It comes with a stylish portable charging case which extends the battery life of the earphones and store them safely.